2017 marks what would have been the 80th birthday of Albanian film director Victor Gjika (1937-2009). To mark this occasion, TIFF will present four of his most well-known fiction works, as they were meant to be seen, on the big screen and in 35mm at the AQSHF (Central State Film Archive of Albania). These four titles, THE EIGHTH IN BRONZE (1970), WHITE PATHS (1974), THE MAN WITH A CANNON (1977) and IN EVERY SEASON (1980) represent Gjika’s considerable talent for collaborating with some of the most notable writers, cinematographers and actors from the ‘New Albania’s Film Studio’ era. Each is a lasting and sometimes controversial contribution to the moving picture images of this country. Largely unknown outside Albania, the defining motion picture work of Victor Gjika is still being debated by critics trying to come to terms with complex notions of art and culture during the fifty years of dictatorship. Born in the southern city of Korca, the ‘Little Paris’ of Albania, Viktor Gjika grew up fascinated by the screenings he saw at the local Cinema Majestic (the largest movie theater in the Balkans at the time). During the 1950’s, when Albania was in the Soviet sphere of influence, Gjika completed his film studies at the VGIK Cinema Institute in Moscow. A fiction short (unfortunately now lost), NOBODY EVER DIES, shot by Gjika and Dhimiter Anagnosti for Estonian director Leida Laius, was honored with the Grand Prix at the International Film Festival for Student Work in Lodz, Poland in 1960. 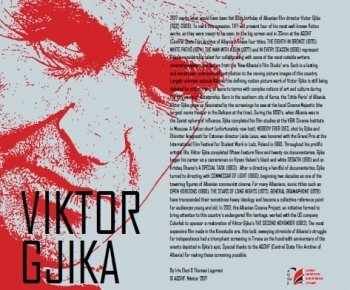 Throughout his prolific artistic life, Viktor Gjika completed fifteen feature films and twenty six documentaries. Gjika began his career as a cameraman on Hysen Hakani’s black and white DEBATIK (1961) and on Kristaq Dhamo’s A SPECIAL TASK (1963). After a directing a handful of documentaries, Gjika turned to directing with COMMISSAR OF LIGHT (1966), beginning two decades as one of the towering figures of Albanian communist cinema. For many Albanians, iconic titles such as OPEN HORIZONS (1968), THE STARS OF LONG NIGHTS (1972), GENERAL GRAMAPHONE (1978) have transcended their sometimes heavy ideology and become a collective reference point for audiences young and old. In 2012, the Albanian Cinema Project, an initiative formed to bring attention to this country’s endangered film heritage, worked with the US company Colorlab to sponsor a restoration of Viktor Gjika’s THE SECOND NOVEMBER (1982). The most expensive film made in the Kinostudio era, this bold, sweeping chronicle of Albania’s struggle for independence had a triumphant screening in Tirana on the hundredth anniversary of the events depicted in Gjika’s epic. WHITE PATHS (1974), 81 min. Legend has it that Viktor Gjika and screenwriter Vath Koreshi worked in a subtle religious metaphor in this story of a heroic telephone repairman who sacrifices his life to restore communication to an isolated village. Four decades after its release, this much beloved drama features actor and director Rikard Ljara’s most memorable performance and was Albania’s first color fiction film. THE EIGHTH IN BRONZE (1970), 95 min. Two and a half decades after a comrade’s death, a group of former partisan’s gather in the soldiers native village to erect a bronze bust in his honor as they recall the fateful moments leading up to his death. For this Second World War drama, Gjika wrote the screenplay together with Albania’s famed novelist Dritëro Agolli which also marked the acting debut of seventeen year old Yllka Mujo. IN EVERY SEASON (1980) 73 min. Film critic Julian Bejko has written that this drama of young romance signaled a decisive turn from the communist regimes emphasis on socialist ideals into the very first reflection on the meaning of love in Albanian cinema. Viktor Gjika continued to explore the possibilities of wide screen photography with a lush score by Alexsander Peci and future defense minister Arben Imami in the role of the young student Bardhyl. THE MAN WITH A CANNON (1977), 86 min. Gjika adapted Dritero Agolli’s popular novel about a farmer who comes upon an abandoned Italian cannon and contemplates using it on his wealthy neighbor rather than the occupying Germans. This sturdy Second World War drama is highlighted by Timo Flloko’s enduring turn as Agolli’s literary creation Mato Gruda and was the first Albanian film to be shot in the widescreen format.